If you missed out on yesterday’s Coachella 2018 performances, fear not! The live stream will be back up and running in just a few short minutes. Scheduled to be on one of the four live stream channels today and tomorrow are Ekali, Django Django, Party Favor, Snakehips, Chromeo, Louis the Child, San Holo, Illenium, Odesza, and Soulwax. Also performing throughout the rest of the weekend will be Marian Hill, Nile Rodgers and Chic, MØ, Tyler the Creator, HAIM, Post Malone, Beyonce, alt-J, French Montana, Portugal. the Man, and Migos. 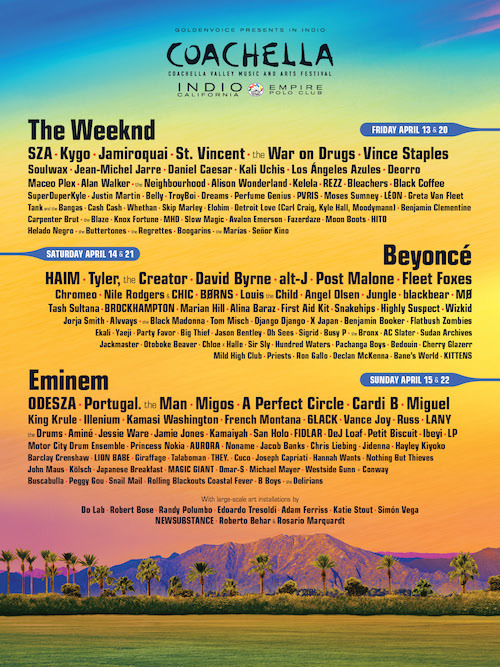 Tickets for both weekends of the 19th Coachella Valley Music and Arts Festival sold out in a mater of hours when they went on sale in January. The event takes place on April 13th, 14th, and 15th and April 20th, 21st, and 22nd at the Empire Polo Club in Indio.